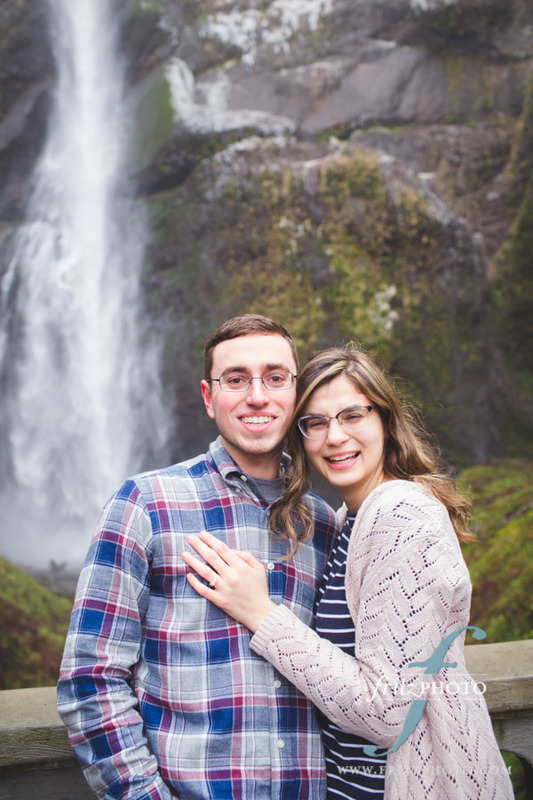 Adam’s Proposal at Multnomah Falls: She Said ‘Yes’! 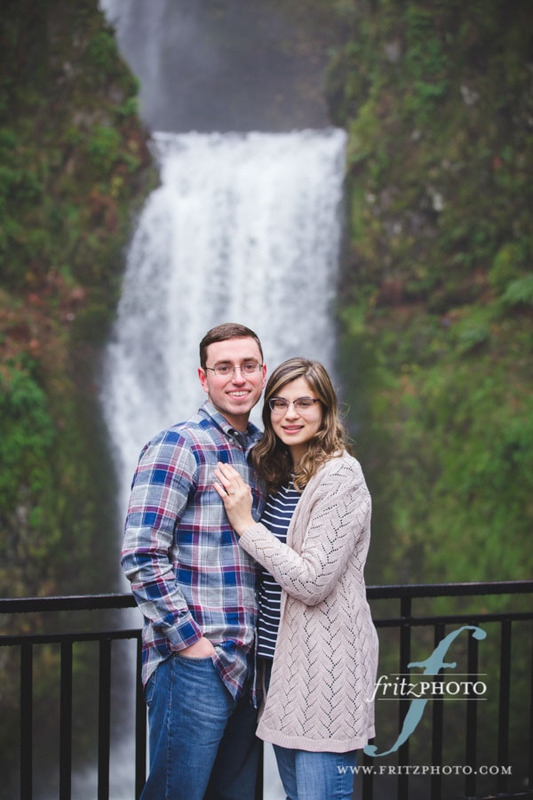 Adam proposed to Stacey at Multnomah Falls this winter, and she said “YES!” We asked them to tell us a bit about how they got together and details about the proposal. Stacey: We met in high school. I think he had a crush on me for a few months, and I ended up coming around after realizing I was jealous when I saw him at Homecoming with a mutual friend. We’ve stayed together through the end of high school, college, Adam’s medical school, and beyond! Adam: The most surprising part of the proposal was how hard it was to get Stacey to the designated spot where we were meeting the photographer! She had to stop at Multnomah Falls Lodge to do some detailed planning of our hikes with the nice woman at the information desk. At this point, we were already late and Stacey didn’t understand why I was rushing her! Stacey: I was expecting the proposal on this vacation. We have been doing distance, and we had been planning a trip to Portland for awhile, so it made sense. Adam: I was nervous to ask! My hands were shaking when I tried to put the ring on Stacey. 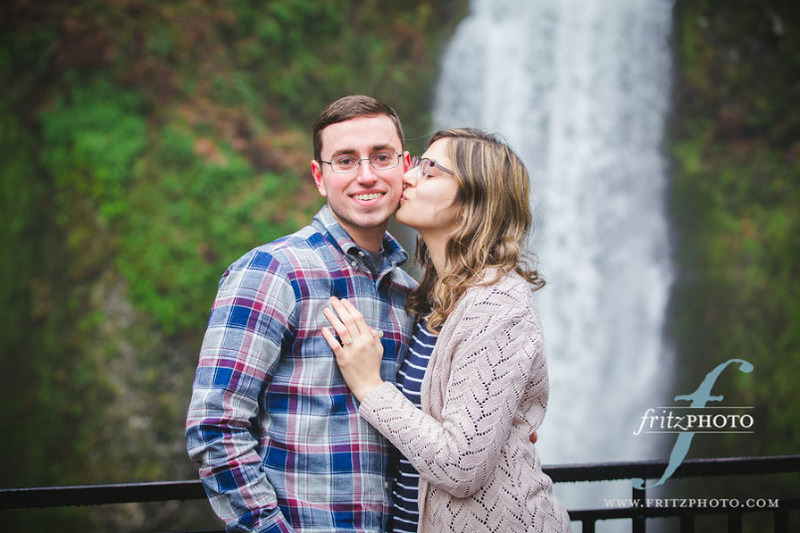 I thought about proposing on the bridge at Multnomah Falls, but I wanted the ring to be securely on Stacey’s finger before venturing up there. I ended up deciding to propose on the lower viewing platform (much safer). Stacey: We will get married in our hometown on Memorial Day weekend in 2020. What are you most looking forward to in your life together? Stacey: What am I most looking forward to? Everything. Planning to propose to that special someone? Call us! We are experienced (and sneaky!) proposal photographer pros in Oregon. We’ll capture it all, and create some beautiful engagement portraits for you while we’re at it!